Buying a car is a big decision for anyone, and these days you can bet that before a consumer walks into a car dealership, they’ll do a few searches on the internet first. According to Autotrader, in 2016 car buyers spent 88% of their time online to shop, and nearly half used a variety of devices to do so. Those numbers have obviously increased by 2018, along with the different strategies available to market your dealership online to reach potential buyers. With this understanding of the impact of the internet in online shopping, you should be concerned about how your dealership appears online. What sort of reviews and feedback appear online? Are people happy or disappointed with your service? Is your website easy to navigate on both desktop and mobile devices? Many of these concerns depend on how you manage your online reputation. Managing it means understanding the impact that the online presence of your dealership has on your business. It’s not enough to just have a great selection of cars, good deals, and well-mannered, sincere representatives. 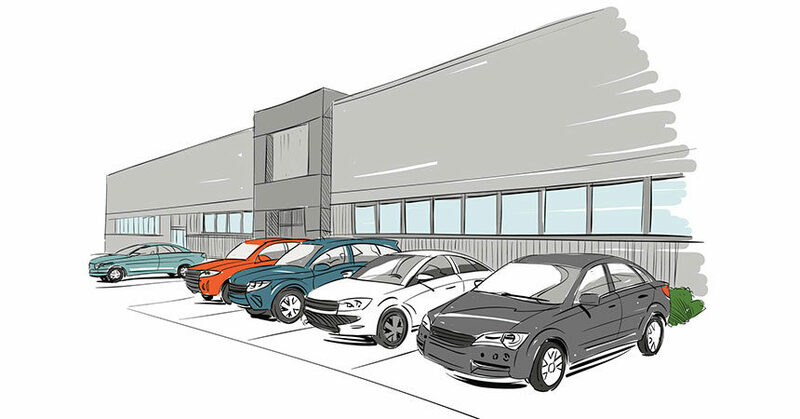 These days, dealerships can’t afford to lose the customer base that uses the internet for shopping and research before ever walking into a brick-and-mortar establishment. One of the first steps is to make sure your online listings in the many available business directories are accurate and updated. People use these directories to identify dealerships that meet their needs and are conveniently located, and to also gain insight through reviews from buyers with experience at them. It’s a good practice to make sure the information about your dealership that’s available online is completely accurate and paints your brand the way you intended. Obvious things like your address and phone number must be accurate, but you also want to make sure that photos on your site give the right impression of your dealership, and are of high-resolution quality. Another important step is to manage your feedback and reviews. It’s always a good idea to ensure there is a feedback form available on your direct website, but also be sure to read through and manage reviews of your dealership on business directory sites such as Yelp or DealerRater. It’s very likely that potential customers will be looking at these sites before they visit you, so remember that the first impression of your business may happen online. When you start receiving or going through your online reviews, try to see them as action items. If any negative reviews are posted, you should do your best to respond to them in a reasonable matter of time. Showing sincerity and taking ownership of a problem or negative experience can potentially attract customers because your response to that review shows that you care about your dealership’s customer relationships. Since we are delving into how the internet impacts your potential buyers, we should also discuss how important it is to embrace social media. Just as with responding to negative reviews, social media is an opportunity to validate and showcase your dealership brand, and create an impression in line with your company’s mission statement and values. Social media platforms are a chance to show the personality of your business, and even your staff. They can provide casual everyday glimpses into the inner workings of your dealership. Do you have an office mascot? Can you produce YouTube videos spotlighting your departments and their expertise? Do you do anything special when it’s the birthday or work anniversary of one of your staff members? All of these things provide an opportunity to showcase your dealership and staff, and customers enjoy their buyer experience more if they feel they can relate to the business they’re dealing with. Maybe you think doing all of this is a lot of extra work. If this is something you’re not ready to allocate a full-time person to, or just don’t feel your existing staff can handle the workload and responsibility, there’s no need to worry. Luckily there are many online resources and services to help you manage your online reputation. Doing so will make your dealership appear more authentic in an industry where many consumers feel they can’t trust car salespeople or worry they’ll be taken advantage of. With your dealership’s online reputation a major influence on your customers, managing it may seem daunting to you as a dealer, but by doing so, you’ll be able to use every tool in your toolkit to drive sales and generate new leads. Garrett Smith is the Founder of RepCheckup, an online reputation management software, and Pitch + Pivot, an entrepreneurial marketing consultancy. He’s also the author of Book Now! Internet Marketing for Healthcare Practices and has been helping businesses successfully sell and market online since 1999.